This is a project which has no definite finishing point... meaning, I will probably keep making new pieces forever. I saw the idea on instructables.com and decided to make one on my own. 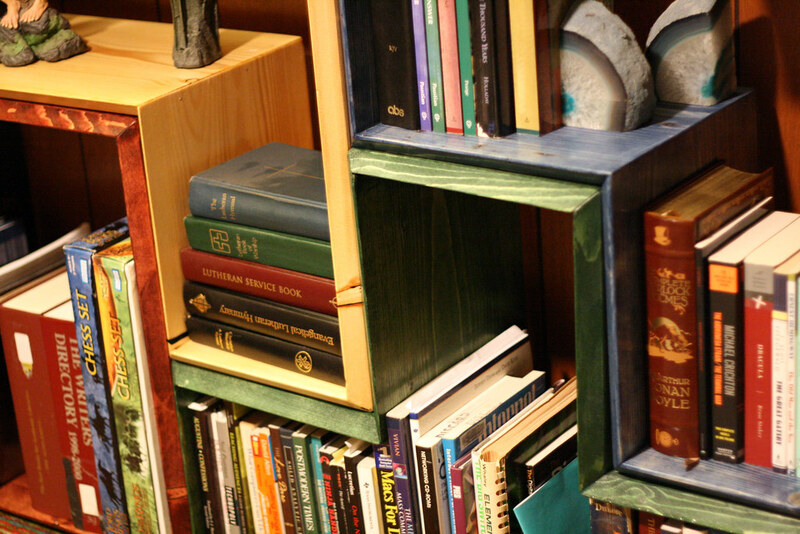 I decided early on that I wanted to bevel the pieces like actual tetris pieces, so that the inside of the shelf would have more surface than the outside. This really helps make it look authentic. I bought the blue to see if it would match the red and it was perfect. The next day I went back and got the green. I knew I wanted a yellow and a brown for my other colors. I decided to use a “natural” stain for the yellow color, since that was a bit easier than getting a colored stain mixed. I didn’t have enough wood to create a long block, but when I do that will be stained with a dark walnut stain. I really wanted to wood to show and the grain to stand out with the project and the water based stain really did a great job. After I had the pieces stained I finished them off with two coats of a high gloss polyurethane. Hardest part of the job was the T-shaped piece. The board I had was warped and it didn’t want to come together nicely. I affixed most things together using small wire nails and glue. I had to use screws on the green piece, and then I accidentally dropped it after I was finished with it. All the glue snapped, so it isn’t quite as strong as it could be. In the future I think I’ll use screws on all my pieces, just to help them hold a little more weight.